When Microsoft first entered the webcam market in 2006, they faced many experienced competitors such as Logitech. Most pundits thought that Microsoft’s new business would never stand a chance. However, over the past year or so the LifeCam series has been pushing the limits of HD webcams. While just about every laptop and netbook features an integrated camera, none come close to the quality of the ones Microsoft offers. 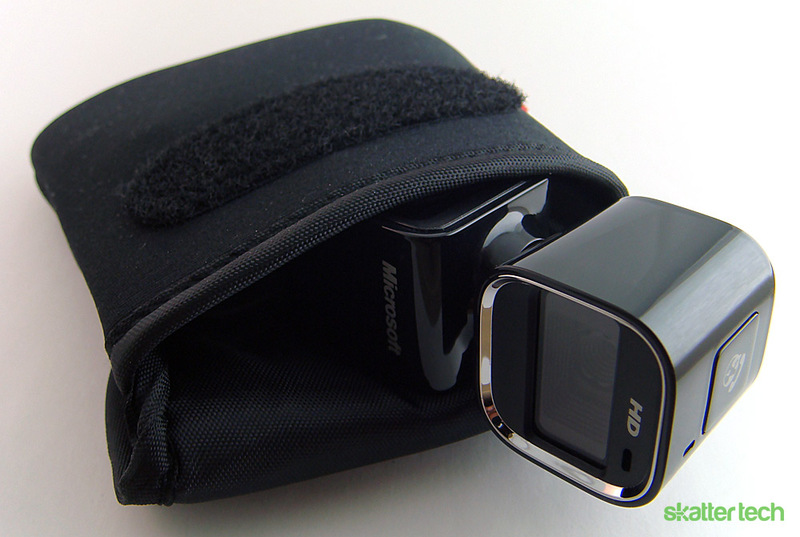 With the launch of the LifeCam Cinema and now the LifeCam HD 5000 and HD 6000, Microsoft is trying to establish itself as a major player in the HD webcam market. Skatter Tech was lucky enough to receive review units of the HD 5000 and HD 6000, and here’s what I’ve found after weeks of testing. Given that the HD-5000 and HD-6000 were both released around the same time, it makes sense that they would have similar physical builds. For example, both cameras have glossy black plastic bodies, as well as clear plastic lenses. They also have buttons on top to launch Windows Messenger Live. There are a few minor differences between the two, however. For starters, the HD-6000 has smaller dimensions, as it is geared towards notebook users. The included USB cable is about 3 feet long, which is understandable due to its compact and portable nature. The HD-6000 grips onto the top of your computer using an adjustable clip allowing it to swivel 180 degrees in both directions. This feature is primarily intended for people on the go and those who need a better viewing range. The HD-5000, on the other hand, uses a flexible base that can be fitted to most LCD monitors, but also stands on flat surfaces. While its flexible base gives it the ability to sit on both monitors and desks, the HD-5000 can only be adjusted vertically. This means that users won’t be able to swivel it left or right when it’s fitted to a monitor. Its ability to stand on flat surfaces, however, gives it full freedom of movement which makes up for its inability to swivel horizontally. 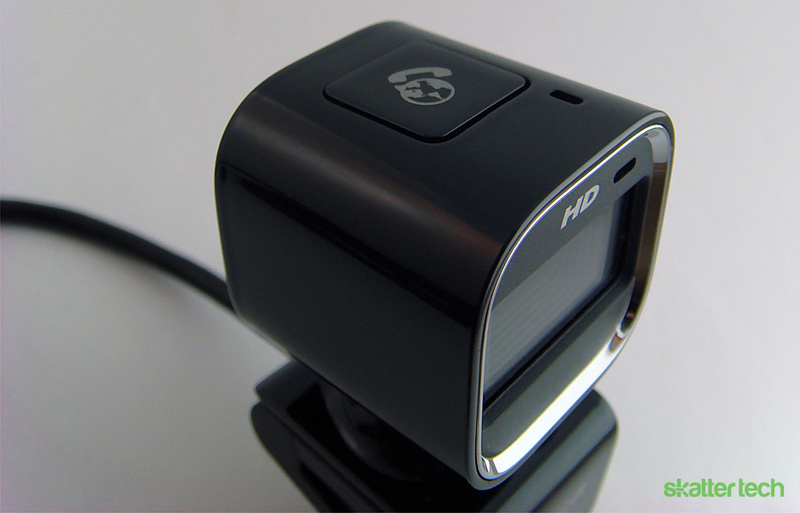 The HD-5000 is also slightly wider than the HD-6000, which allows it to support 16:9 widescreen mode. Even with its extra width, the HD-5000 is still a relatively small camera, and users should have no problem carrying it around. Both cameras worked right out of the box, but I did have install the included software disc in order to access the extra features. These extra features include camera effects, the ability to change various core settings, and the ability to turn off and on TrueColor. The camera effects themselves were surprisingly well done; the hardware and software were able to track my motion fairly well. Whether you want to sport an afro, sunglasses, tiara or cowboy hat, the effects are an amusing addition. The customizations are available whether recording a video, capturing a mug shot, or video chatting on Skype. For resolution settings, options vary from 160-by-120 pixels to 1280-by-720 pixels HD. Basic audio recording capability comes with the software as well. Audio recordings are in the Windows Media Audio (WMA) format, which is not surprising given that the product is from Microsoft. The installation disc is only compatible with machines running Windows, so unfortunately Mac users do not have access to these additional features. One of the main features of both cameras is Microsoft’s new image processing technology called TrueColor. This feature adjusts picture quality according to the current lighting environment to ensure that the picture is properly exposed. The technology makes sure that the photo is not too bright or too dark to avoid a loss of detail. For example, given an especially bright room, TrueColor will automatically adjust the picture to kill extra, unnecessary light. My main gripe with both cameras would have to be their ability to autofocus. 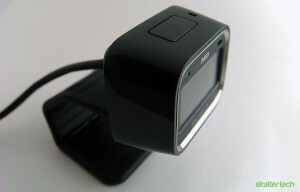 While it may seem like a useful feature to have in a HD webcam, it turned out to be more of a nuisance than a convenience in both the HD-5000 and HD-6000. Both cameras are highly sensitive to movement within their field of view, so they attempt to refocus after every major movement from the user. Fully refocusing can take anywhere from 6-8 seconds, and scaling up the resolution increases image capture delay, which in turn worsens the autofocus issue. Sometimes, the cameras will even try to refocus multiple times at once, prolonging the amount of time it takes to get a clear and consistent image. Even though both cameras have issues with their autofocus feature, they did manage to deliver in terms of their image quality. Poor adaptation to lighting is definitely one of the cruxes of many webcams on the market. Microsoft TrueColor is surely a step in the right direction. Both cameras managed to adapt well to both brighter and darker settings. One thing to note is the 4-5 seconds it took for the cameras to either kill or capture extra light from the environment. While that may seem like a long time, it pales in comparison to the 6-8 seconds it takes for the cameras to refocus which prolongs blurriness and lack of clarity in the image. Colors were also slightly washed out in brighter settings and dull in dark settings; however, the image itself was very crisp and detailed. In normal lighting conditions, colors were exceptionally vivid. Color settings can adjusted manually by using the additional software included with both cameras. If there’s anything both cameras really delivered on, it was their ability to maintain a consistent frame-rate close to 30 fps. 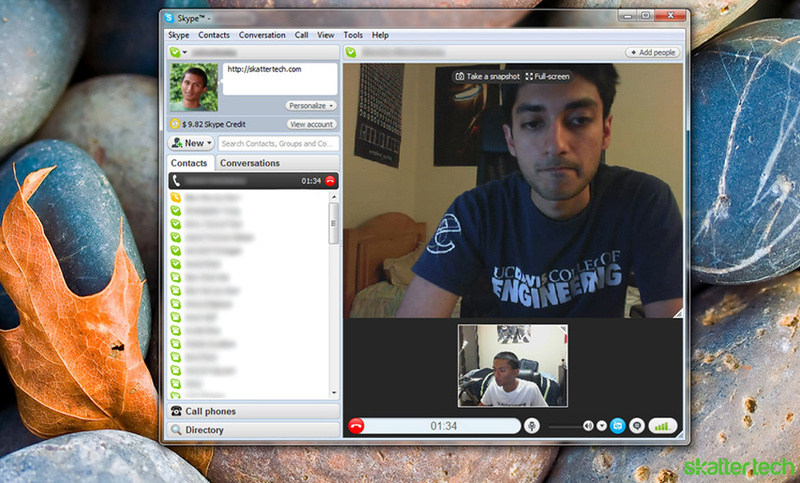 During the video call, no frequent drops in frame rate occurred. However, when at the highest settings, both webcams were definitely CPU hogs. When tested at 720p HD at 30 fps on a 2.0 GHz Core 2 Duo, CPU usage went up for both cameras by close to 65%. This issue is most likely due to the fact that neither the HD-5000 nor HD-6000 have built-in hardware encoding. This means that there is no hardware built into the cameras to compress and process captured video, which leaves your computer’s processor to do all the necessary encoding. Therefore, in order to be able to run both cameras without issues, the required computer specifications need to be satisfied. 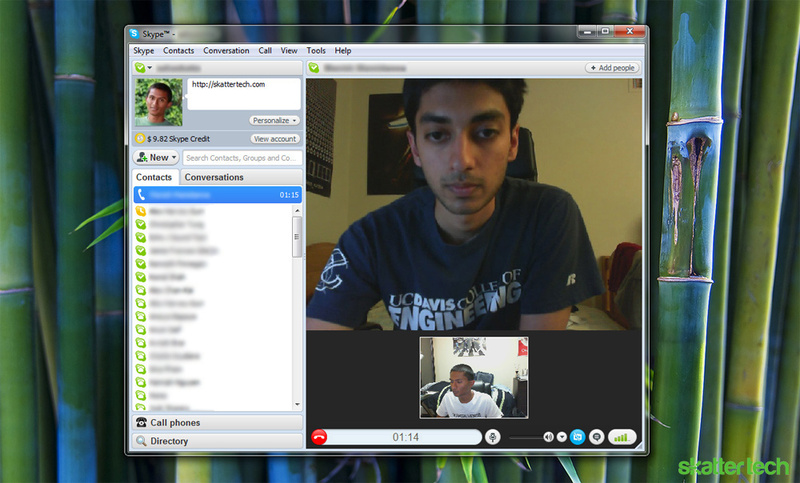 Decent audio quality is an integral part of any webcam session. The HD-5000 and HD-6000 each have integrated microphones with noise cancelling technology. Both of the webcams’ microphones successfully reduced any background noise in the environment and made speech sound crisp and detailed. When recording video, I was surprised at how much the microphones picked up on subtle aspects of my voice while removing external noises. The built-in microphone on the webcams definitely met my expectations in terms of audio quality. 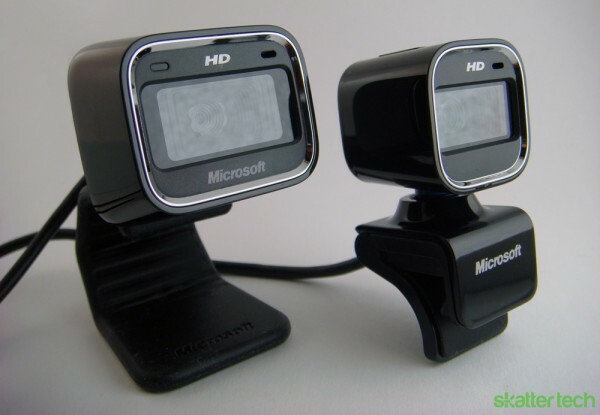 Microsoft made their debut in the webcam market back in 2006 with the LifeCam series. With the release of the HD-5000 and HD-6000, Microsoft has managed to offer crisp and clear HD at a more affordable price. Currently retailing at $49.95 and $59.95 respectively, the HD-5000 and HD-6000 are definitely comparable to the higher end Cinema. 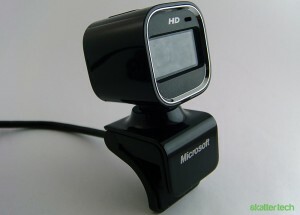 Even with their fair share of issues like auto-focusing, slow adjustment to light, and extra CPU usage, both webcams are helping Microsoft establish a stronghold in the HD webcam market. Although they don’t provide the ideal HD video chat experience, the HD 5000 and HD 6000 are a good blend of price and performance. These webcams just about guaranty improved video and audio quality over the built in camera on your laptop display. 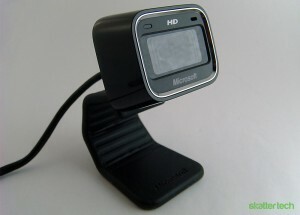 For beginner video podcasters or heavy Skype users, these webcams are an excellent complement to your Windows or Macintosh machine. I have a question. Couple of days ago I bought HD6000 for Skype, but I can’t fix horizontal mirror for this camera.Can some one help me? The cameras are actually much smaller than they look. I just got my 6000 and it’s great, for all it’s worth. The truth is that my laptop (Core 2 Duo 1.8GHz) cannot even manage to render HD without getting choppy, although it does not freeze. I don’t know what to do about it. 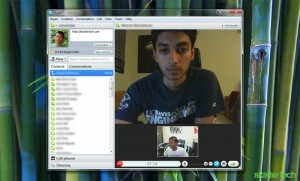 Sorry Nick, I could not find a setting for mirroring either, neither in Skype, nor in the bundled software. Although the LiveCam software has a host of funky high-tech (though useless) features. Could you share with me how to make it to 720P@30FPS? What kind of software and codec you used to make it happen? Awesome review. I found it extremely helpful. Microsoft ought to hire you. If you already work for them, they should fire you then give you a job op with higher pay. That was a great review and article. Thank you.